by Kilem L. Gwet. Ph.D. 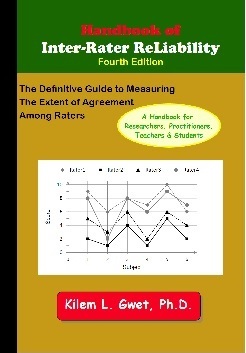 Welcome to the website of the 4th edition of the "Handbook of Inter-Rater Reliability: The Definitive Guide to Measuring the Extent of Agreement Among Multiple Raters." The third edition of this book was very well received by researchers working in many different fields of research. The use of that text also gave these researchers the opportunity to raise questions, and express additional needs for materials on techniques poorly covered in the literature. For example, when designing an inter-rater reliability study, many researchers wanted to know how to determine the optimal number of raters and the optimal number of subjects that should participate in the experiment. The fourth edition of this text addresses those needs, and more. •	New material on sample size calculations for chance-corrected agreement coefficients, as well as for intraclass correlation coefficients. •	The chapter entitled "Benchmarking Inter-Rater Reliability Coefficients" has been entirely rewritten. •	The introductory chapter has been substantially expanded to explore possible definitions of the notion of inter-rater reliability. •	All chapters have been revised to a large extent to improve their readability. The primary objective of this book is to give researchers and students in all fields of research, the opportunity to access in one place, detailed, well-organized, and readable materials on inter-rater reliability assessment. Chance-corrected agreement coefficients are covered as well as agreement coefficients in the family of intraclass correlations. Other rank-based measures of association, and agreement coefficients within the framework of item analysis are discussed as well. The methods and techniques developed in this handbook can handle missing ratings, which are common in most experiments. Errors found in this third edition are documented on the Error Page. Users of the statistical package R may download r functions for computing many of the coefficients discussed in this book. Learn more about the content of this book, by downloading chapter descriptions below. For some chapters, the reader may also download Excel spreadsheets showing detailed calculations related to the chapter examples. support@123agreestat.com (Note: remove all numbers 123 from email address. (i.e. @123agreestat becomes @agreestat.com).